Acoustic Energy - Manufacturers of quality speakers for hi-fi and studio use. Acoustic Zen - Loudspeakers by Robert Lee. Adafruit Industries - A New York City based open-source hardware company that sells kits and parts for original, open source hardware electronics projects as well as other open source tronix'. AIWA - Audio and video products, DVD players, mini audio and home theater systems, headphone stereos, portable compact disc players, portable stereos, radios, tape recorders, headphones and accessories, car audio. AKG K495 NC by Harman - 'NC' stands for 'noise cancelling', but it could also stand for 'no contest', because when it comes to pure, undisturbed sound, the AKG K495 NC headphones deliver high-quality performance and active noise control that are second to none. Durable and easy to charge through the USB, these top-of-the-line headphones create a perfect audio world: you get all the sound you want, and none of the sound you don't. State-of-the art, active noise-cancelling technology (closed -loop technology). Anthony Gallo Acoustics - Loudspeakers and accessories. Atlantic Technology - High performance speaker systems. Audio-Technica - High-performance headphones, microphones, mixers and electronic products for home and professional use. Autographer - A small, wearable, hands-free, fully automatic camera. Automatic Expresso Machines - Expresso machines. Bang & Olufsen - TV/HDTV, DVD, VCR, radio and CD, music systems, telephones, multimedia, convergence. Baratza LLC - Expresso machines. Beats Electronics - Headphones, earphones, speakers. BenQ USA - Consumer electronics, computing, communication. Bose - Home audio, speakers, and headphone sound solutions. E.g., see Bose Bluetooth Headset Series 2. Boston Products - Audio, acoustics products. Bowers and Wilkins (B&W) - Loudspeakers. Bushnell - Binoculars, telescopes, riflescopes, spotting scopes, and rangefinders. Calumet Photographic Online - High-quality imaging products. Cambridge SoundWorks - Factory-direct audio company selling highly-acclaimed speakers and music systems. Canon - Business machines, cameras, optical products. Casio - Audio, calculators, cameras, clocks, music instruments, portable TVs, printers. Chat and Vision - VoIP and communication equipment. Partnering with various brand owners like Plantronics, RTX, Tely Labs, Skype, and more. Crystalio II - An excellent video processor with 10-bit Gennum VXP high-definition deinterlacing, scaling, and image processing technology. Denon - High quality audio and audio/video equipment and software products for the entertainment and information industries. DJI - Flying and camera stabilization systems: drones. Dolby Laboratories - Develops audio signal processing systems and manufactures professional equipment to implement these technologies in the motion picture, broadcasting, and music recording industries. EarHero - A new breed of tiny earbud headphones aims to let listeners enjoy music without shutting out the sounds of everyday life. Endless Analog - Audio technology, including CLASP (Closed Loop Analog Signal Processor), a hardware and software system that improves the sound quality of digital audio. Escient - Most noted for its FireBall music server, Escient is taking a serious stab at video management with its DVDM-100 library and jukebox. Esoteric Audio - New video up-conversion technology allows output of high definition (HD), video resolution (up to 1080p), from your existing DVD collection, without having to buy new software. Esoteric Audio disc players up-convert CD audio with proprietary algorithms offering a wide range of options, topping out at 24bit, 32 times over-sampling. Fluxmob - Portable battery backup and wall charger. Fujifilm- - Imaging and information products, including film, cameras, videotapes and audiotapes for consumers and professionals; chemical-free and environmentally-friendly digital photographic color printers, photographic paper, minilabs, digital imaging products (including digital cameras for commercial and consumer use), photofinishing services, computer and optical disks, data tapes and cartridges, computer accessories, microfilm, motion picture film, a complete range of products for the graphic arts industry, and more. Galaxy SII - A smartphone running under the Android operating system. The Galaxy S II has a 1.2 GHz dual-core Exynos system on a chip (SoC) processor, 1 GB of RAM, a 10.8 cm (4.3 in) WVGA Super AMOLED Plus screen display and an 8 megapixel camera with flash and full 1080p high definition video recording. It is one of the first devices to offer a Mobile High-definition Link (MHL), which allows up to 1080p uncompressed video output with HDMI while charging the device at the same time. USB On-The-Go (USB OTG) is supported. The user-replaceable battery on the Galaxy S II gives up to ten hours of heavy usage, or two days of lighter usage. Samsung claims that talk time is 9 hours on 3G and 18.3 hours on 2G. Also see Wikipedia. Goodwin's High End - Designs and installs high end audio and audio/video systems, home theaters and whole house music systems. Google Pixel Buds - Wireless headphones. Touch and hold the right earbud to ask your Assistant to play music, make a phone call, or get directions, all without pulling out your phone. Pixel Buds can even translate between languages in real time using Google Translate on Pixel. GoPro - 'Wearable' camera/camcorders such as helmet cameras that are used to capture high-definition adventure video/photography. Grace Digital - Wi-fi radio like the Bravado-X Wi-Fi Radio. Grain Audio - High end wood headphones, earbuds and speakers. Grundig AG - TV, SAT, DVD, VCR, LiveCam, HiFi, audio portables, car audio. Hauppauge Digital Inc. - Media receiver products designed to receive digital media from PCs via local area networks, and then decode and display the media onto TVs. Hitachi - Markets a wide range of products, including computers, semiconductors, consumer products and power and industrial equipment; HDTV, VCR, DVD players, DVD Cam, visual technologies. Infinity - Home and car audio speaker systems and related accessories. InnoMedia - IP telephony solutions for corporation/business environments, the home office, and consumers. Jawbone - Wearable technology and audio devices. Also: creator of the Jawbone ERA and ICON Bluetooth headsets; NoiseAssassin technology, the world's first and only military-grade noise-eliminating technology; and the JAMBOX wireless speaker and speakerphone. JBL - Premium speakers from JBL such as wireless bluetooth speakers, Android & iOS headphones, soundbars, subwoofers, home theater systems, computer speakers, & iPod/iPhone docks. Get the best sound for music, smartphones, tablets and TVs with JBL speakers. Recommended: JBL Xtreme. JVC - Audio and video technology. Kaleidescape - Video data manager offers full DVD content storage (six terabytes) with a proprietary interface, Movie Guide, and instant metadata access. Users access any movie in their collection from any viewing zone in the home. It stores up to 400 films and offers bookmarking and search functionality by every conceivable category. Kenwood - Home and car audio. Kodak - Accessories, Batteries, Cameras, Chemicals, Films, Photo CD, Picture CD, Printers, Projectors, Scanners, Software. Konica Minolta - Photographic and digital imaging technology, digital cameras, APS cameras, 35 mm cameras, Hexer cameras, single-use cameras, film, film scanners, photo printers, ink jet paper, minilabs. Kyocera - Wireless phones, copiers, printers, fax machines, solar energy products, LCDs and thinfilm devices, electronic components, semiconductor parts, advanced ceramics. Lasonic - Markets the Digital Audio Server, a digital audio component that brings the power of computer networking to any stereo system, by providing access to all your music from virtually any place on your network. LG - Electronics, appliances, mobile devices, home entertainment. E.g., theLG Signature OLED TV W8 - 4K HDR Smart TV w/ AI ThinQ - 77" Class (76.8" Diag): OLED77W8PUA. Leica - Cameras, lenses, binoculars and projectors. Level Mount - A leader in flat panel TV mounts. For example, see DC65ADLP. Lexar - End-to-end solutions for digital photography. Linn - A Scottish company, based near Glasgow in Eaglesham, East Renfrewshire, that manufactures hi-fi audio equipment, home theatre, and multi-room integrated audio systems. It is the manufacturer of the Linn Sondek LP12 turntable. Get detailed info, images and technical specifications on all Linn products. Logitech - Wi-fi music players; Internet radio such as the Squeezebox Radio; Harmony Remotes. Marantz - Home entertainment products. Maxim - design, development, and manufacture of linear and mixed-signal integrated circuits (ICs). Maxim circuits "connect" the real world and digital world by detecting, measuring, amplifying, and converting real-world signals, such as temperature, pressure, or sound, into the digital signals necessary for computer processing. MeCam - Hands-free wearable video camera that pins or clips to your shirt, can be worn as a necklace, or attached to anything to capture video from that point of view. McIntosh - Home theater systems, high end audio and turntables. Microtech - CD manufacturing duplication equipment. Minox - 35mm cameras, compact cameras, binoculars. Mitsubishi Electric - High-definition projection televisions, DVD players, factory automation equipment, medical devices, escalators, elevators, automotive equipment, telecommunications systems, heating and air conditioning, semiconductors, large-scale video displays for stadiums and arenas, and electric utility products. Monster Cable - Cables for audio, video, home theater, car, computer, satellite, and custom installation. Moon - High end home theater and audio components. Motorola - Software-enhanced wireless telephone, two-way radio and messaging products and systems, as well as networking and Internet-access products, for consumers, network operators, and commercial, government and industrial customers. Music Hall Audio - Dedicated to manufacturing, importing and distributing well priced, top quality, high-end audio components. Its emphasis is almost exclusively 2-channel (stereo); a rarity in this day of iPods and multi-channel products. Music Hall manufactures its own range of turntables in the Czech Republic. These are produced in a factory that has been making turntables for over 50 years. All Music Hall turntables come fitted with arms, cartridges and dust covers. They consistently make the "Recommended Components" list in Stereophile Magazine. Nakamichi - Audio/video and multimedia equipment. Narrative Clip - A tiny camera and GPS that you clip on and wear. It's an entirely new kind of digital camera with no controls. Instead, it automatically takes photos as you go. The Narrative app then seamlessly and effortlessly organizes them for you. Nikon - Photo/electronic-imaging equipment, binoculars and telescopes, eyewear, IC and LCD equipment, instruments. Niles - Audio/video installation products. Nokia - Mobile phones and accessories. Olympus - Cameras, acoustic microscopes, ultrasonic endoscopes, and digital voice recorders. Onkyo - Receivers, DVD players, CD players, amplifiers, accessories. Oppo - 4K Ultra HD blu-ray players and other electronic devices. Region-free Region Free Oppo UDP-205 4K Ultra-HD Blu-ray Player at 220-Electronics. Origin Live - Manufacturer of high performance turntables, tonearms, power supplies and accessories. Ortofon - Professional sound cartridges. Panasonic - Audio, computer products, digital cameras, DVD, home appliances, musical instruments, telephone, fax, television, video. Parasound - Audio and home theater components. Pentax - Cameras, lenses, flashes and photo accessories. Pentopia - Stylus pens for use with handheld PCs or PDAs. Philips - Flat TV, Digital and HDTV, Satellite Systems, VCRs, Audio, DVD+Rewritable, Intelligent Remote Control, Internet Devices, PC Peripherals, Home Cinema. Pinnacle Systems - Digital video products. Pioneer - Plasma, projection TV, DVD & LD, A/V receivers, CD players, recording devices, speakers, accessories, systems. Pixel Magic Systems - Home theater solutions. Core business is developing innovative home theater and high definition products with advanced software programming and design. Pixel Magic created a world-first by developing a Linux-based video processor under the successful Crystalio brand. Polaroid - Instant cameras, film and accessories; digital imaging solutions. Polk Audio - Speaker systems. Princeton - CRT displays, LCD flat panel displays, HDTV. PreSonus - Software, microphone preamps, signal processors, digital audio interfaces, mixers, and control surfaces. Proscan - Televisions, DVD players. Rane - Audio products, including: amplifiers, equalizers, home cinema, mixers, music/paging controllers, programmable ethernet bridge, preamplifiers, signal processing, teleconferencing, accessories. RCA - RCA DIrectTV Systems, digital media, TVs, VCRs, audio, camcorders, DVDs, Internet products, digital cameras. ReQuest Multimedia - Dynamic storage and playback solutions; DVD Library solutions. ReQuest's products are designed to enhance and simplify the enjoyment of new media by creating central storage devices that allows access to all your favorite content from any location. Revel - Loudspeakers and subwoofers. Ruark Audio - Digital audio broadcasting (DAB) radios. Runco - Large screen projection, VHD processors, DLP systems, CRT projectors, plasma systems, rear projectors. Samsung - Blu-ray players, Galaxy Smartphones and Tablets, QLED TVs like the Samsung 75" Class Q9FN QLED Smart 4K UHD TV (2018), memory products. Sencore - Electronic test instruments. Sengled - Integrates consumer electronics with energy-saving LED lighting. For instance, the Sengled Pulse Master bulb. Sharp - Digital audio, video, television, handheld devices. Shure - Microphones, audio electronics, wireless gear, turntable cartridges. Sonos - A smart system of HiFi wireless speakers and audio components. Sony and Sony Premium Home - PlayStation, the PlayStation Vita, BRAVIA LCD televisions, the Sony 65" A9F OLED 4K Ultra HD, VAIO personal computers, Xperia smartphones and tablets, Handycam camcorders, the F65 4K professional camera, and the Cyber-shot, Alpha DSLR and NEX digital cameras. SSB Electronic USA - Manufactures and distributes HF, VHF, UHF and SHF equipment covering 10MHz. - 47.0GHz. Its products include: Wireless LAN / WAN Bidirectional Linear Amplifiers, Low Noise Preamplifiers - LNA's, RF Linear Amplifiers, Relays, Transverter Systems, Frequency Translation Systems, Downconverters, Antennas, Parabolic Dishes, Coaxial Cable, Relays, Antenna Switches, Microwave Test equipment, PC controlled Receivers, Microwave Linear Amplifiers including models for Telemetry, Wireless, and CDMA applications. Studio Electric - A design / build audio systems boutique equipment shop. Sylvania - Lighting products, TVs, VCRs, computer monitors. TDK - Digital audio and video. Technics - High-quality audio components. Terk Technologies - High-tech antennas. THX - THX puts all Home THX products through an exclusive series of rigorous performance and ergonomic tests designed to ensure that your purchase will be reliable and easy to enjoy for years to come. Only then can a product be eligible for Home THX Certification. THX Certified components include laser disc and DVD players, controllers and receivers (with digital 5.1 decoding), power amplifiers, speakers (fronts, surrounds and subwoofers for bass) and various system accessories (cables, equalizers and acoustically transparent projection screens). Either a complete system or any individual component (with its corresponding THX benefits) can be purchased from local THX dealers. ToCAD - Sunpak Electronic Flash Units, Video Lights, Camcorder Batteries and Cellular Batteries, SLIK Photo and Video Tripods and Accessories, Zero Halliburton Aluminum Photo and Video and Computer Cases, GE and Sanyo Lithium Batteries. TomTom - The world's leading supplier of in-car location and navigation products and services. Toshiba - Televisions, DVD players, VCRs, portable digital, home theater, cordless phones. Uniden - Cordless phones, radar detectors, marine radios, FRS radios, scanners, CB radios. Unity Digital - Enabling technology for digital photography and handheld devices including flash memory cards, card readers, adapters, and portable power solutions. van del Hul - High quality product range covers moving coil (MC) and moving magnet (MM) phono cartridges as well as a broad range of audio cable and wire products serving consumer, professional and industrial applications. Vienna Acoustics - High end speakers and loudspeakers for your home theatre. Vidikron - High-performance video projectors and home theater products. Vizio - High definition TVs as well as accessories ranging from Blu-Ray players to sound bars. Xabler - Offers a server designed to connect to any RCA output from a VCR, security system, camcorder, etc., with no custom connectors required. Users will be able to see networked ethernet cameras and Xabler's own video server in one integrated user interface. It works with any browser video server interface without the addition of extra plug-ins or Java Applets. Yamaha - Musical products and software, professional audio equipment, accessories. For instance, see the Portable Grand: DGX-650 Digital Piano. Zenith - Digital high-definition television (HDTV) technologies, DVD players, VCR, VCP, clock radios, audio CD player/recorders. ZiLOG - Microcontrollers and microprocessors. Adafruit - DIY electronics and kits. Alex's Electronic Resource Library - An online guide to useful electrical and electronic information. Links to test and measurement, motors, components, passives, semiconductors, tutorials, searchables, shareware, assembly and packaging, interesting reading, core memory, glossary and acronym lists. AnalogAholic | ToneAudio Magazine - E-journal of analog and digital sound. AudioREVIEW - A place to read reviews about audio and video gear, share your experiences with others and even buy and sell new and used gear in our classified section. Audio Video Interiors - Home theater industry publication. AV8003 Networking AV Preamp/Processor - The best in contemporary technology combined with traditional Marantz quality. Unites all the entertainment possibilities you want: Movies, music and photos. AVguide - Audio, video, and home theater system equipment reviews including A/V receiver, projection screen, TV reviews, and more. AVIASearch - Resource for locating products and services for the home electronic industry. Califone Voice Saver Personal PA System - Ideal for small meetings, briefings, facility tours, and classroom instruction, this unit is self-contained and weighs only eight ounces. Just plug in the microphone, clip the lightweight amplifier onto your belt and turn it on. CNET: Reviews - Product reviews for digital photography, home audio, home theater, portable computing, communications, portable music. CommVerge - Examines emerging technologies from the consumer point of view. Consumer Electronics Association (CEA) News - Source for information about the consumer electronics industry. CEA membership unites more than 650 companies within the U.S. consumer technology industry. Comsumer Review.com: Electronics - Reviews of electronics, including home audio, camcorders, cameras, communications, digital cameras, portable audio, televisions and home video. ConsumerSearch: Electronics Reviews - Expert electronics product reviews: Alkaline Batteries, Answering Machines, CD Players, CD Writers, Cordless Phones, DVD Players, Handheld Computers, PDA, Minidisc Players, MP3 Players, Personal Video Recorders, Portable CD Players, Portable Headphones, Table Radios, Television Sets, TV-VCR Combos, Two-Way Radios, VCRs, Video Game Consoles. Design News Directory - Search or browse for listings of products, suppliers and service companies. Digital Camera Resource Page (DCRP) - The DCRP is designed to be an unofficial resource for current and future owners of digital cameras. It is aimed more towards the consumer end, rather than the high end (read: $5,000) professional cameras. Digital Photography Review - Digital camera and digital imaging news, reviews of the latest digital cameras, discussion forums, digital camera samples galleries, digital camera buyers guide, side-by-side comparisons and the most comprehensive database of digital camera specifications and prices. Discover Blackberry - A leading wireless connectivity solution. BlackBerry is developed by Research In Motion Limited (RIM). Through the development of integrated hardware, software and services that support multiple wireless network standards, RIM provides platforms and solutions for seamless access to time-sensitive information including email, phone, SMS messaging, Internet and intranet-based applications. DisplayMate - A leader in video diagnostics, which are used in the calibration, testing, evaluation and optimization of image and picture quality for all types of displays, such as CRTs, analog and digital LCDs and plasma displays, video projectors, microdisplays, HDTVs and more. Droid X - Features a 4.3" hi-res screen, HD camcorder and 8MP camera. Connect with HDMI or wireless HD. Connect to or become a WiFi hotspot. DVDinsider - Source for DVD news, reviews, giveaways and newsletters. Electronic House - Expert information and insight on integrated home technologies. ELP Laser Turntable - Plays vinyl records with CD quality sound, and is perfect for record collectors, archivists and vinyl enthusiasts alike. Engadget - For gadget lovers. Epinions.com: Reviews of Electronics - Source for unbiased advice, personalized recommendations, and comparative shopping. FlatpanelsHD - Guide to TVs, media streamers and monitors. Gizmodo - An online review dedicated to gadgets, gizmos, and cutting-edge consumer electronics. GOPRO - "Wearable" camera/camcorders such as helmet cameras that are used to capture high-definition adventure video/photography. HDTV Galaxy - Comprehensive website devoted to consumer news, shopping tips, HDTV broadcasts, product information, product reviews, and more. Helipal - Remote control helicoptors, parts and accessories. Home Theater - Home theater news, information, product reviews. Home Theater Review - Reviews for HDTV, LED HDTV, Plasma HDTV, HDMI Receivers, Soundbars, etc. iLounge - All things iPod. In the Dark About Picking a Light Bulb? This FAQ Can Help - From NPR. Also see NPR's Guide To Changing Light Bulbs. Mobile Phones UK: Online Guide - Reviews and best buys for mobile phones. Phone Scoop - Cell phones. PhoneDog.com - Reviews for the most popular long distance, local service, voice over IP, cell phone and plans, and many more services, carriers, rates and plans. PLAYSTATION®3 - Computer entertainment system unleashes a brilliant, high-definition entertainment experience. As its digital soul, the Cell Broadband Engine represents a tour de force in parallel processing, which means a gaming experience that is beyond what you know today. Its built-in blu-ray disc drive delivers a whole new generation in high-definition gaming and unmatched digital media storage. Whether it's gaming, Blu-ray movies, music or online services, PLAYSTATION3 invites you to Play Beyond. ProNet Web Guide - The home of the Pro Net Web Guide for the audio, replication and systems contracting industries. As such it contains thousands of entries in the audio, replication, and contracting area. Rane Professional Audio Reference - Glossary of audio-related terminology. Ray Super Remote - A universal remote that aims to change how you watch TV. Also see Wired review. Reg Hardware - Product news and gadget reviews. Retrevo - Find product reviews, manuals and support for laptops, computers, digital cameras, GPS, cell phones, printers, camcorders, and more. Samson Technologies - An audio technology company designing wireless microphone systems, today an industry leader with three distinct brands: Samson, Hartke and Zoom. 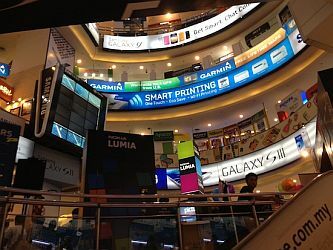 Samsung - Information for Samsung's TVs, mobile phones, video and audio, computers and related products, various home appliance products, core components. See Samsung 75" Class Q9FN QLED Smart 4K UHD TV (2018). It's about $6,000 at Amazon. Sencore - Specializing in signal transmission solutions for the broadcast, cable, satellite, and IPTV video networks. Includes information about products and applications. Sony A9F OLED - Poster boy for Sony’s new Master Series TVs. The 65-inch model will run you about $4500 at Amazon. Also see Sony Z9F LCD, the 75" will set you back around $6,000 at Amazon. Sound and Vision - Expert analysis on audio and video and hands-on guides. stereo411 - Hi-Fi home audio and video resource. Dealers, discussion, equipment, manufacturers, reviews. Sound & Vision - Provides authoratative tests and reviews of home theater equipment such as HDTVs, speakers, home theater, Blu-ray players, LCD and Plasma TVs, amps, preamps, subwoofers and more. SpectraCal - Provides color calibration tools for any calibration setup. calibrating professional studios, home theaters, computer monitors and more. Stereophile - Equipment reviews and show reports. E.g., see Floor Loudspeaker Reviews. STORM Drone FF Flying Platform (RTF) - Quadcopter stable enough to fly around and able to carry a GOPRO camera for 6-7 minutes of flight time. TechRadar - Technology news and reviews, covering computing, home entertainment systems, gadgets and more. The Absolute Sound (TAS) - Expert reviews, features, and commentary on high-performance audio and music. Of interest: 2013 TAS Editors' Choice Awards: Loudspeakers $2000-$3000 and The Absolute Sound/Hi-Fi+ Guide to High-Performance Loudspeakers. Tom's Hardware: Articles and Reviews - Consumer electronics news and resources. Trusted Reviews - TV, camera, computing, home appliance, gaming reviews. Twice - Consumer electronics news. User Manuals for Consumer Electronics - Retrevo provides more than 100,000 manuals from more than 1,000 brands. V3.co.uk - UK technology news, reviews and downloads. Wearables - From smartwatches, to fitness trackers, VR headsets and more: wearables reviews, news, videos, forums, guides. Widescreen Review - Home theater product reviews, industry news, DVD reviews, equipment reviews. Wireless Design and Development - - Latest product and equipment introductions for the global wireless market and resource guide for manufacturers of thousands of wireless products. 220-Electronics - Multi-system TVs, region free blu-ray & dvd players, home theater systems, major appliances, kitchen appliances, personal electronics and more - all from the top name brands & all with warranty. 800 - Video, TV, home audio, digital cameras, personal audio, telephones, wireless phones. Adolf Gasser Photography - Serving the San Franicsco Bay Area's photo needs since 1950. A staple among professionals and hobbyists for sales and rental of still and video cameras, lighting and motion picture equipment. Amazon.com: Electronics - Handhelds, cameras and photography, computer add-ons, portable music, home theater, wireless phones. Audio Gurus - Speaker packages, receivers, audio/video cables, and HDTVs. AudioVision - Home audio and home theater equipment. Location: 1603 Pine at Van Ness, San Francisco. Ph: (415) 614-1118. B&H - Photo, video, audio, lighting, pro accessories, computers, data storage, optics, entertainment, projection and surveillance devices. Battery Junction - Batteries, battery chargers, flashlights, solar products & more. BatteryWeb - A retailer and wholesaler of all types of batteries, including AC Delco, Dell, Gateway, IBM, Prevailer DryFit, Optima, Odyssey Drycell, Panasonic, Power-Sonic, Sonnenschein, and Yuasa batteries. Beats - Headphones, earbuds, and other audio devices made with Beats by Dre audio technology. BestBuy - Computers and peripherals, home audio and video, personal audio, photo and imaging, accessories. BestPriceAudioVideo - Audio and speakers, camcorders, DVD players, fax and phone, photo, photo printers, TV and VCR. C. Crane Company - Radios: AM/FM/TV/WX, scanner, shortwave, transceivers. Antennas: AM, auto, CB, FM, television. Calumet Photographic - Digital cameras, 35mm Cameras, DSLR, camcorders, amateur to professional photographic equipment, photo printers. Cambridge Soundworks - Audio, video, home theater, multimedia, portable audio, accessories. Cameraworld - Cameras, digital cameras, camcorders, lenses, video accessories, audio, DVD players, VCRs, video editing, televisions, binoculars, scopes. CellPhoneCity - Stay current and maximize your budget by purchasing refurbished electronics from Cell Phone City. CircuitCity - Digital cameras, PDAs, MP3 players, wireless phones, electronic gaming, film cameras, satellite TV systems, TV video and camcorders, home audio, computers and peripherals, portable electronics, phone fax, pager, car audio, accessories. Crutchfield Electronics - Home theater and A/V. car audio, A/V-PC convergence. Da-Lite - Projection screens, presentation products. Designer AudioVideo - A/V gear. Digibid - Professional equipment marketplace. A real-time online auction specializing in the sale of media creation and entertainment technology production equipment. digital cameras - Digital cameras. Digital Connection - Multimedia convergence products. Earphone Solutions - High quality headphones for the best prices. eCycle Best - Sell your iPhone, laptop, smartphone and tablet for cash. Flashlightlens - Lenses to fit Maglite, Mini Maglite, TigerLight, Streamlight, Brinkmann, SureFire, Pelican, Arc, Longbow, PentagonLight, Elecktrolumens, Mr. Bulk, Night-Ops Gladius, JIL/JIL Lite, RAW, Fire~Fly,and more. Replace your scratched plastic or polycarbonate flashlight lens with glass. Future Sound - Home entertainment systems onsultation, design and installation. Grahams - Hi-fi shop in UK. Galen Carol Audio - High-end audio. HDTV Galaxy Database - Search HDTV Galaxy's database to compare and shop for the web's best deals. HeadRoom - Shop for headphones, headphone amplifiers, DACs, and other personal audio products. Reviews thousands of headphones from manufacturers like: Sennheiser, Sony, Koss, Etymotic Research, Beyerdynamic, AKG, Shure, Monster, Audio Technica, Grado, Skullcandy, and others. HIDEF Lifestyle - Projectors, televisions, remote controls, audio, mp3 players, plasma TV, LCD TV, DLP TV, DILA TV, power protection, DVD, DVR, Tivo. HomeTech Solutions - One-stop shopping for home automation NS security products and information: X10 and Leviton lighting controls; telephone, audio, and video wiring and distribution; hard water treatment; and more. See HomeTech's Learning Center tutorial section Sitemap for site overview. iQVC: Electronics - Audio and video, computers and software, DVD, photo and optical, telephones, video games. Intermusic - Guitars, synths, MIDI, mixing, DJs, recording, gear reviews, music tutorials. Jameco - New and out-of-production electronic products. Integrated circuuits, components, computer products, test and measuring equipment. L-com Connectivity Products - Cable assemblies, connectors, adaptors and supplies. LedLight - Find everything made with LEDs. Loewe - High-quality television, video, stereo and telecommunications products. Looking Glass Camera and Photo Supply - Berkeley, CA. Digital cameras, media, inkjet supplies, printers, scanners and digital accessories. Lumenlab - Provides LCD projectors and/or the information to build a quality home theater projector: simulation, robotics, Gantry robot, emulation, DIY robotics. Magnolia - Premium audio, video and home automation gear. Miele - Authorized Miele vacuum dealer, the Vacuum & Sewing Center, located in Redwood City, California. MonoPrice - Offers a wide range of products from standard PC products, network cables, and HDMI cables to custom cable assemblies and wiring harnesses. Music Lovers - High-end audio, video, and home installations. One For All - Pre-programmed Universal Remote Control and other wireless products. OneCall - Audio accessories, batteries, binoculars and scopes, blank recording media, cables and interconnects, camcorder and camera accessories, camcorders, cassette decks, CD players and recorders, clock radios, computer accessories, digital still imaging, DVD players, home theater, MiniDisc, personal organizers, photography, portable audio, power amplifiers, preamplifiers, range finders, receivers, remote controls, satellite systems, speakers, subwoofers, telephones, televisions, tuners, turntables, VCRs, video editing, video Walkman. PhoneJammer - Cell phone jammer products online sales. Photojojo - Gifts and gear for photographers. Planet Omni - Multisystem televisions, VCRs and converters, PAL Camcorders, and GSM phones. Plaza Low Yat Shopping Centre - Specializing in electronics and IT products in Malaysia. RadioLabs - High quality wireless, radio, and electronic products. RadioShack - Wireless telephones, telecommunications products, electronics parts and accessories, TV, audio, video, wire, cable, hardware and tools. Retrevo - Retrevo uses artificial intelligence to analyze and visually summarize more than 50 million real-time data points from across the web to give shoppers the most comprehensive, unbiased, up-to-date product information they need to make smart, confident decisions about what to buy, when to buy, and where to buy: Accessories, Camcorders, Desktops, Digital Cameras, DVD / Blu-Ray Players, GPS, HDTVs, Home Theater Systems, Laptops / Netbooks, Mobile Phones, MP3 Players, Printers, Receivers, Tablets, Wireless Routers. Savant Audio - From its first large scale installation in 1967 to its latest research in amplifier and cable designs, Savant Audio has continually striven to provide for each client the best solution for their particular circumstances, interests, goals and budget. The consequent audio and video systems usually encompass a broad range of fields - electronics engineering, architecture, cabinet-making, stonework, interior design, sculpture, software engineering, computer systems design, home construction, etc. All aspects of the project are integrated to ensure the ultimate satisfaction of the client. Satellite Theater Systems - Specialize in Full View Systems, including assembling the right equipment needed to fit the perfect environment. Satellite receivers, laser disc player, DVD, Super Beta, Hi8 or Super VHS VCRs; quality direct view, rear or front projection sets, HDTV; and quality audio amplifiers, speakers and interconnects. shopforacomputer - Human edited electonic shopping directory includes computers, CD players, DVD players, cameras, home theater, phones and more. Sign Video - Video production, editing and duplication equipment and accessories. Sony Store - Shop the Sony online store and buy laptops, computers, TVs, cameras, camcorders, Walkman MP3 Players and more. soundcity - Home audio, video, car audio, home theater, cables and interconnects, A/V furniture, phones, accessories. Spearit Sound - Adcom, B&W, Beyer, Cambridge Audio, Cary, Classe, conrad johnson, Creek, Crestron, Da-Lite, Dreamvision, EAD, Escient, Esoteric Sound, Faroudja, Infinity, Gallo Acoustics, Grado, Kimber Kable, Krell, McCormack, Music Hall, NAD, Nitty Gritty, ODL, Paradigm, Rotel, Runco, Russound, Shanling, Siltech, Soundlink, Stax, Teac, Thiel, VPI, Zenith. Spy Base - Miniature, pinhole and disguised cameras, security cameras, listening devices, audio and video recorders and monitors, telephone tap and tap detectors, telephone conversation recorders, "how-to" books, locksmithing tools. Stark Electronic - Distributor of electronic parts and products. Specializes in TV antenna equipment from suppliers such as Channel Master, Winegard, Antennacraft, Blonder-Tongue, TDP and others; Winegards DSS portable and RV mount antennas; DSS Digital Satellite TV antenna equipment for multi receiver hookup. Stereotype HiFi - Online Hifi Shop based in Auckland, New Zealand. Source of home audio entertainment, cinema, theatre and music needs. TechToolSupply - Distributor of low voltage tools and equipment specializing in cable TV, satellite, CCTV, home theater, phone, data, fire, and security. The Wiz - Consumer electronics, audio, video, home office, music, movies, accessories. Think Tank Photo - Camera and laptop bags and accessories. uBid.com: Consumer Electronics Auction - Audio, video, speakers, digital cameras and camcorders, mobile, telephones, portable audio, digital satellite, games, DJ/music equipment. Vanns - Authorized dealer for Sony, Toshiba, Onkyo, Kenwood, JVC, Philips and H/K. Worldwide Electronics - 220 volt appliances and electronics. X.10 - Home automation and security supersite. Cameras, home entertainment, home automation and control, security, and accessories. Xtend Technologies (Ohio) - Design and installation of home theater systems that combine sophisticated audio and video applications; plasma televisions or even 150" movie screens with high quality speakers, amplifiers and sound absorbent materials. ZDNet - Guide to the digital age: communications, digital cameras, digital video, gear, home audio, home theater, televisions. This webpage last updated on Saturday, October 20, 2018 8:11 AM.